Is China making an unprecedented leap to the top of the global economic hierarchy? Yes, Martin Jacques asserts confidently in his buzz-generating When China Rules the World. He sees the country, which recently passed Japan to become the world's No. 2 economy, rising smoothly to the top spot by continuing to follow a thoroughly distinctive, Confucian-tinged development path. No, say China skeptics like economist John Markin and hedge-fund honcho James Chanos, with equal self-assurance. They predict that bursting bubbles will lead to a Chinese equivalent to Japan's "lost decade" of the 1990s. To them, as George Friedman pithily puts it in his best-selling The Next 100 Years, which is sometimes displayed near Jacques' tome in airport bookstores these days, China is just "Japan on steroids." While we're too aware of how regularly  and speedily  bold forecasts about China are proved wrong to offer one of our own, our research into 19th century America and contemporary China, respectively, leads us to flag a third possibility: China could stumble but keep climbing upward, much like the U.S. did about a century and a half ago. We find today's China less reminiscent of Japan in the 1980s than it is of the U.S. in the 1850s. Don't get us wrong. We don't expect breakneck growth to continue unabated. China faces daunting challenges, from a rapidly graying workforce to endemic corruption to energy needs that are increasingly hard to satisfy. To say that China faces major challenges, though, doesn't undermine the American analogy. The same was true of the U.S. circa 1850. The U.S. was then, as China is now, a predominantly rural country undergoing a massive shift toward an urban, industrial economy. By the 1850s, the U.S. was en route to becoming the workshop of the world, rapidly churning out cheap yet high-quality textiles, clocks, guns and other goods. The British dubbed this miracle the "American system of manufactures," and it became the envy of the world. Much as China's capacity for producing seemingly endless quantities of cheap goods is now earning it the ire and admiration of other countries. U.S. commentators complain that China's success has been predicated on chicanery (like the manipulation of the yuan), dubious business practices and wanton disregard for copyrights. In doing so, they echo things that British commentators once said about America's rise, back when New England factories used reverse engineering to mimic the latest Lancashire technological breakthroughs and Dickens complained of making no money from the pirated copies of his novels sold in the country. To use a line often attributed  probably inaccurately  to Mark Twain, history doesn't repeat itself, but it often rhymes. And this is one of those cases. 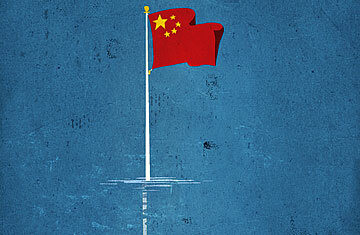 What of the bubbles that China skeptics flag? Numerous speculative real estate bubbles grew and burst while the U.S. rose. Each time, the economy recovered and went on to grow again at a blistering pace. So too might China's. And the fundamental contradiction between China's political structure (nominally communist) and its economic structure (largely capitalist)? The U.S. was an extraordinarily different place politically in 1850, but it didn't lack contradictions. It prided itself on devotion to freedom and equality, yet slavery played a pivotal role in its economy, women lacked basic rights and Native Americans were grossly mistreated. Just as the U.S. struggled throughout the 19th century to resolve its contradictions, so will China in coming years. It needs both tighter regulation of the economy and looser control of society, and while the Chinese have ever greater choices to make and spend money, they still do not have sufficient say about how they are governed. The analogy outlined here is far from perfect. But imperfect historical analogies have value  if they help us see the present in a new light. In this instance, the main payoff of looking back to the U.S. of the 1850s is simply that it gets us out of two boxes. One is that of thinking of China as a purely exotic case  a place that's not just different from but completely the opposite of the U.S. The other is thinking of it as a country whose boom is sure to end soon, just like that of the last Asian country to reach the No. 2 economic spot. These are boxes Americans need to escape. Otherwise, they won't be able to get a clear-eyed view of the brash young nation (the People's Republic is just 61 years old) across the Pacific: a country leapfrogging its way toward the top of the economic order and in the process stirring anxieties in the U.S. that rhyme remarkably well with those an adolescent America once triggered in the aging empire across the Atlantic. This article originally appeared in the November 15, 2010 issue of TIME Asia. See Five Things the U.S. Can Learn from China.